Los Angeles Rainfall at 96% of Normal for the Water Year. Upper Low Skirts Coast. 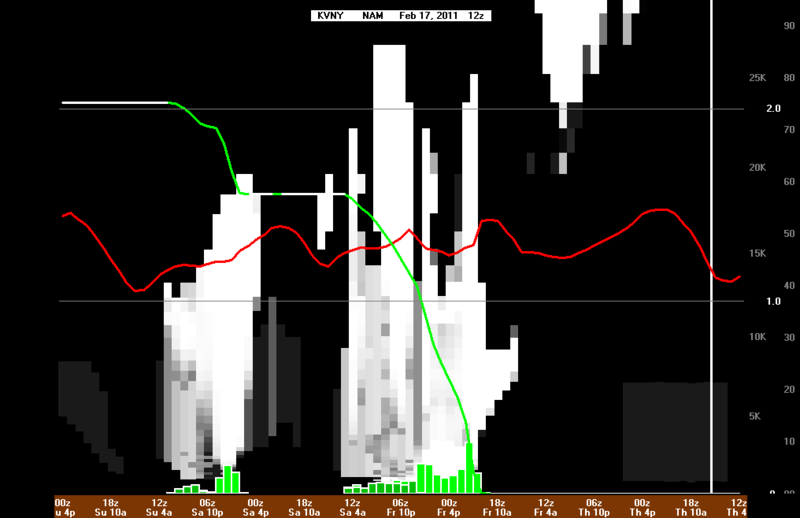 Rain at End of the Week? The rainfall totals from Friday's and Saturday's systems were generally a little below the 2 inches forecast, but it was still enough to boost the water year rainfall total for Downtown Los Angeles to 14.58 inches. This is about 96% of the normal water year total of 15.14 inches. The water year extends from July 1 to June 30, so we still have four months to receive the 0.56 inch of rain that would put us at 100%. Here's an archived copy of a NWS tabulation of some rainfall totals from around the area from early Thursday morning to 10:00 a.m. Sunday. Southern California's wet weather pattern didn't extend into this week as it looked like it might. The upper low that might have produced the rainfall is now forecast to stay offshore. At the moment it looks like it will mainly result in some clouds as it moves down the coast today through Wednesday. Rain chances increase near the end of the week and into the weekend as an upper low and trough work down the West Coast. Ensemble members vary quite a bit on the track of the upper low, with some solutions wetter in Southern California than others. We'll see! Los Angeles Rainfall at 87% of Normal for the Water Year and Counting. More Rain on the Way. La Nina Moderating - Will It Rebound? The transition from a persistent West Coast ridge to a West Coast trough occurred on Monday more or less as forecast by medium range guidance back on February 5. A series of systems and impulses riding up and over a high amplitude Eastern Pacific ridge are expected to continue to produce cool, blustery weather in Southern California with periods of showers and rain into next week. Precipitation on Valentine's Day was generally limited to areas north of the Los Angeles basin, but was a little more widespread late Monday night into Tuesday morning, with a number of stations in the Los Angeles area recording a few hundredths of an inch of rain. Wednesday's system was much more energetic. Because of the convective nature of the precipitation, rainfall amounts were extremely variable, ranging 0.25 inch or less to 1.0 inch or more. Downtown Los Angeles (USC) recorded 0.65 inch of rain for the storm, bringing the water year total for Los Angeles to 13.14 inches. This is well above normal for the date, and about 87% of normal for the water year. Here's an archived copy of a NWS tabulation of some rainfall totals for the period 4:00 p.m. Tuesday to 4:00 a.m. Thursday. Los Angeles only needs about 2 more inches of rain to top the 100% mark for the water year, and it looks like we could get most of that Friday and Saturday. BUFKIT analysis of 12z NAM data for Van Nuys indicates about 1.6 inches of rain Friday into Saturday, and then another 0.5 inch Saturday night. 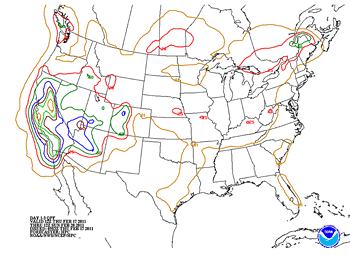 The HPC 3-day Quantitative Precipitation Forecast for the period ending 4:00 a.m. Sunday also indicates about 2.0 inches of rain in Southern California. This morning's 09z SREF puts the probability of more than 1.0 inch rain for the 24 hour period ending 1:00 p.m. Saturday at about 70%. Temperature data at the surface and at depth in the equatorial Pacific suggest the La Nina is moderating. The tough question is whether warming will continue into the NH summer, with neutral ENSO conditions prevailing as we move into autumn; or if the ENSO cycle will swing back toward a La Nina state. Since 1949, about half of the first year La Nina episodes continued into a second or third year. At the moment the majority of computer models favor a transition to ENSO neutral or warm conditions by July 2011. Here is a compilation of ENSO Forecasts from the IRI ENSO Quick Look for February 17, 2011. We'll see! West Coast Ridge Doesn't Regress. Chance of Rain For Valentine's Day? Although the Pacific jet did expand as anticipated through about January 27, and then retract around January 29, leading to a upper low off the California coast, it wasn't the discontinuous ridge regression which had been hoped for -- or the change in pattern that would open the door to Pacific storms wishing to visit sunny Southern California. The area did manage to get a bit of rainfall out of the system. Downtown Los Angeles (USC) recorded 0.21 inch on Sunday, bringing the rainfall total for January up to a paltry 0.79 inches, which is more than 2.5 inches below normal for the month. At this point Downtown Los Angeles remains almost 5 inches above normal for the water year (July 1 to June 30), but with each dry day that cushion grows a little smaller. Here's an archived copy of a NWS tabulation of some rainfall totals from last Sunday's storm. Well, what the MJO couldn't do maybe random influences will. 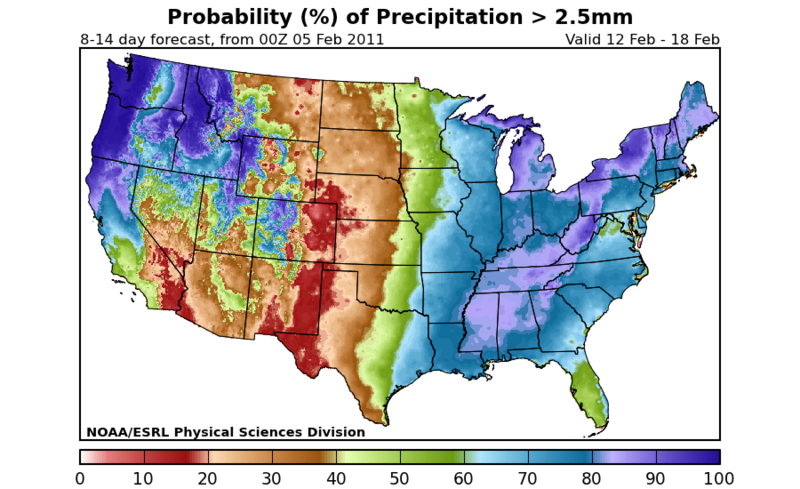 Both the GFS and ECMWF are forecasting a change to a wetter pattern for California around Valentine's Day. 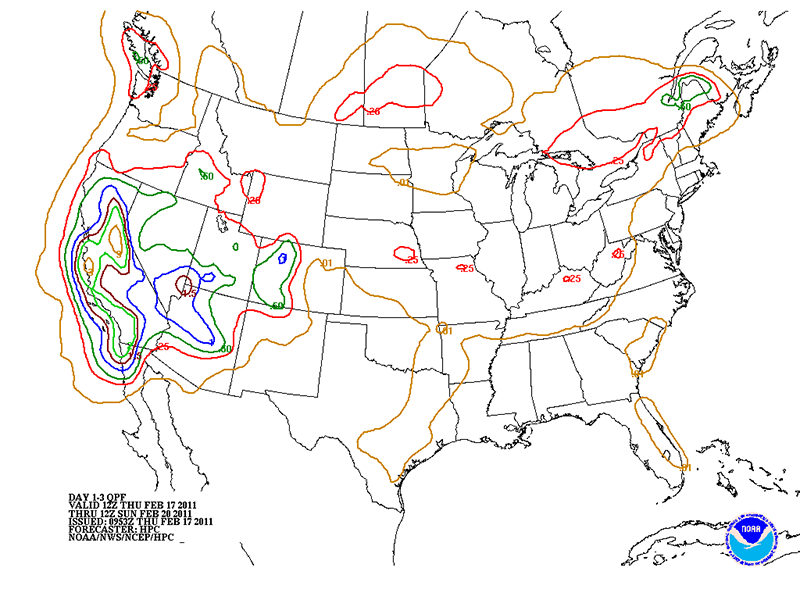 This is supported by the NCEP Ensembles, and ESRL/PSD Analog Probabilistic Precipitation Forecasts for the 8-14 day period. As this CPC 8-14 day Precipitation Outlook indicates, the chances look the best from Central California, north into Oregon. We'll see!